So, let’s take a look at some of the steps you can take to make sure your garage door is safe. This is important because the garage door is often the largest moving object in the house and is used, on average, 1,500 times a year. A few precautions are made before a garage door is even put into service. Pinch-resistant garage doors are constructed in such a way to make sure door panel joints don’t pinch fingers, or anything else, when they are closing. 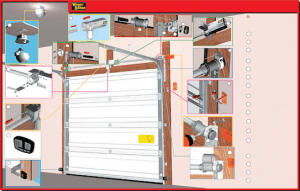 To keep the garage door components securely in place, tamper resistant bottom brackets are connected to the door spring, which is under extreme tension. These brackets make sure only trained professionals are able to adjust the most volatile part of the garage door. Once the garage door has been installed, there are still steps that need to be taken on a monthly basis to make sure the door system is as safe as possible. First, inspect the door to make sure the springs, cables, rollers, and pulleys appear in good working order. If there is visible wear on any of these components, contact Performance Building Products to find out if – or when – the parts might need to be replaced. Testing the garage door reversing mechanisms is recommended as well. For newer models, place a piece of a 2×4 board in the door’s path. If the door does not reverse direction after coming into contact with the board, you may need to have the mechanism repaired or replaced. Additionally, test the movement sensors at the base of the garage door. When the door is being closed, wave an object in front of the sensors. If the door continues to close, repair is needed. If your door doesn’t have either of these systems, contact Performance Building Products to see about having one installed. These simple tests can make sure your garage door is safe to use – an important factor when it comes to the largest moving part of your house that gets daily use. Contact us at Performance Building Products for residential and commercial garage door installation and repair.